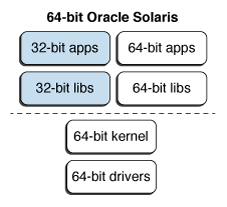 The following figure shows support for 32-bit and 64-bit applications in the Oracle Solaris 11 operating environment. The Oracle Solaris 11 OS supports 32-bit applications and libraries and 64-bit libraries and applications simultaneously on top of a 64-bit kernel that uses 64-bit device drivers. In the 64-bit environment, a process can have up to 64-bit of virtual address space, that is, 18 Exabytes. This virtual address space is approximately 4 billion times the current maximum of a 32-bit process. Note - On some systems, the full 64 bits of address space might not be available if used for other purposes via VA masking or ADI. If an application requires only support for large files, the application can remain 32-bit and use the Large Files interface. However, if portability is not a primary concern, consider converting the application to 64-bit. A 64-bit program takes full advantage of the 64-bit capabilities with a coherent set of interfaces. 64-bit arithmetic has long been available in earlier 32-bit Solaris releases. However, the 64-bit implementation uses the full 64-bit machine registers for integer operations and parameter passing. The 64-bit implementation allows an application to take full advantage of the capabilities of the 64-bit CPU hardware. The 64-bit system interfaces are inherently more capable than some of their 32-bit equivalents. Application programmers concerned about year 2038 problems, when 32-bit time_t runs out of time, can use the 64-bit time_t. While 2038 seems a long way off, applications that do computations for future events, such as mortgages, might require the expanded time capability.